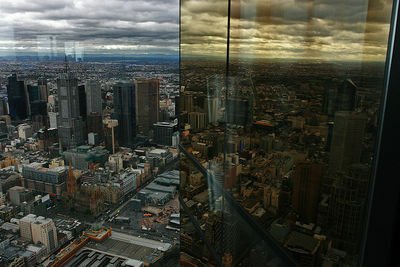 Seeing Melbourne from the 88th level of a building may seem a little crazy at first – but the view is totally worth it! If you don't like heights, you're probably going to beg to differ. And if you're claustrophobic and don't like been rocketed from ground floor to level 88 in an elevator with slight turbulence, then you should probably stop reading. But if you're a thrill seeker and not afraid of such things, then read on. Once on the 88th floor of the Eureka Sky Tower, Melbourne city looks something like a model city that could have been constructed from Lego pieces or wooden blocks. Seeing the familiar city from such heights puts a new perspective on things and allows for an insightful appreciation of how the city is built and structured. For architects and engineers, a whole new viewpoint on analysing building designs and structures is yours for the taking. Walking around the circular Skydeck offers spectacular scenery from every angle and the city can be seen from up high, looking from the Westgate Bridge to the iconic MCG. Photography is allowed in this section of the building so definitely bring a camera. If it's a clear day the glass windows barely intrude upon photography, but if it's cloudy and overcast you mightn't be so lucky. If you're up for something a bit more daring the Edge Experience is on offer. This involves standing in a glass box some two metres away from the edge of the building, and essentially getting a birds' eye view of Melbourne city from up high. Probably not for the weak-willed, although there are sturdy metal railings to grasp on to for dear life, and survival is guaranteed. However, the cost is a slight downside to the Eureka Sky Tower. With the admission cost, prices varying depending on ages and concessions, only getting you to the 88th floor, there is an additional cost if you want to go on the Edge. What's more, photography is not allowed on the Edge, so if you want a photo of your experience out there you have to pay even more. It's a subjective decision how much you think it's worth – you are able to view photos before purchasing. This is an activity for the whole family if you're all prepared or great for couples or friends in the city on the weekend. Essentially, it is one of those 'what you make of it' experiences, totally up to you how much you enjoy it.